Endive (Cichorium endivia var. latifolium): growing, planting, caring. A hardy cultivar for a late autumn harvest. Chicory is easy to grow - the wild species grows by itself on the edge of roads or in wasteland. This is one of the advantages they have on lettuces, that, and their good resistance to cold which make them perfect winter vegetables. 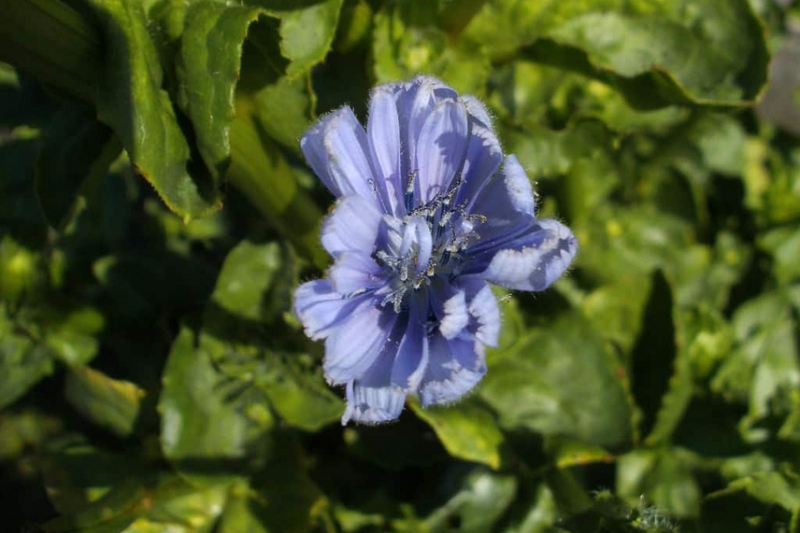 In summer the chicory is adorned with long-headed heads - petals - blue. There are many species of chicory, some of which are grown for the consumption of leaves, and others for their roots. Among the leafy chicory some are perennial and others biennial - they only bloom in the second year, but they are generally grown as annuals. Sow in warm, cool soil - in the "not dry at depth" - and humic, in full sun. Sow in open soil from June to July, every two weeks. Space the lines 40 cm apart, and sow in a low density, because you will keep only one plant every 30 cm: you can mix the seeds with sand for easy handling! Work the soil finely on the surface, leaving no clods, finishing with a scratching and a delicate raking. Cover the seedlings with one centimeter of mature compost. Sprinkle gently with a watering can or better, with a sprayer, without creating a swirl that would take away the seeds. Water especially after the sowing and during summer. Water twice a week for the first month. Then, you will only need to water during dry periods. Don't tire yourself out. The rest of the time, watering only causes disease! After emergence, thin the plants, leaving only one every 30 centimeters depending on the variety, to facilitate their development. You can of course immediately transplant the plants that you have cleared on new lines, but shelter them from the direct sun at first! Mulch right afterward. Harvest according to your needs, cutting them at ground level. Remember that chicory become tough if you let them produce seeds. After the winter, tear off your chicory plants to make room for new ones.